Dr. William M. Dunne received his B.S. and Ph.D. in geology from the University of Bristol, England. He joined the faculty of West Virginia University as an assistant professor of geology in 1980, and was promoted to associate professor in 1986. In 1988 he joined UT's College of Arts and Sciences as an associate professor of geology, was promoted to full professor in 1995 and in 1997 was named head of the Department of Geological Sciences. Dunne was appointed as associate dean for research, facilities and graduate student policy in the College of Arts & Sciences in 2002. In 2009, he was appointed as associate dean for research and technology in the College of Engineering. His research concerns the development of mountain belts and the characterization of fracture networks in rocks. The latter interest has practical importance with regard to hydrocarbon exploration, and groundwater remediation efforts, leading to collaborations with civil engineers. 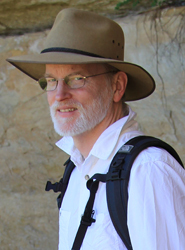 Dunne serves as an editor of the Journal of Structural Geology since 2006. He has also served as the chair of the Structural and Tectonics Division of the Geological Society of America, and is a Fellow of the Society. He joined the Executive Board of the ASEE Engineering Research Council as president-elect in 2015. His teaching has received institutional recognition with the Department of Earth & Planetary Sciences Teaching Award in 1991 and 1995, UT Chancellor's Excellence in Teaching Award in 1994 and the College of Arts & Sciences Senior Faculty Teaching Award in 1995. At present, Bill is not recruiting graduate students due to administrative responsibilities within the University. However, he continues to serve on the committees of graduate students working with other faculty members in the department and to serve as an editor of the Journal of Structural Geology. Beddingfield, C. B., D. M. Burr, and W. M. Dunne, 2015, Shallow normal fault slopes on Saturnian icy satellites. Journal of Geophysical Research: Planets, v. 120, p. 2053-2083. Roy, A., Perfect, E., Dunne, W.M., and Odling, N., 2010, Lacunarity Analysis of Fracture Networks: Evidence for Scale-Dependent Clustering. Journal of Structural Geology, v. 32, p. 1444-1449. Cook, J.E., Dunne, W.M., and Onasch, C.M., 2006. Development of a dilatant damage zone along a thrust relay in a low-porosity quartz arenite. Journal of Structural Geology, v. 28, p. 776-792. Dunne, W.M., Ferrill, D.A., Crider, J.G., Hill, B., La Femina, P., Waiting, D., Fedors, R., Morris, A.P., 2003, Orthogonal jointing during coeval igneous degassing and normal faulting, Yucca Mountain, Nevada, Geological Society of America Bulletin, v. 115, p. 1492-1509. Rohrbaugh, M.B., Jr., Dunne, W.M., and Mauldon, M., 2002, Estimating joint trace intensity, density and mean length using circular scanlines and circular windows. American Assocation of Petroleum Geologists Bulletin, v. 86, p. 3089-2104. Hogan, J.P., and Dunne, W.M., 2001, Calculation of shortening due to outcrop-scale deformation and its relation to regional deformation patterns. Journal of Structural Geology, v. 23, 1507-1530. Smart, K. J., Dunne, W. M., and Krieg, R. D., 1997, Roof sequence response to emplacement of the Wills Mountain duplex: The roles of forethrusting and scales of deformation: Journal of Structural Geology, v. 19, 1443-1459. Thorbjornsen, K.L., and Dunne, W.M., 1997, The origin of thrust-related folds: Geometric vs. kinematic tests: in Anastasio, D.J., Erslev, E. A., and Fisher, D. M., (eds. ), Fault-related Folding, Journal of Structural Geology, v. 19, p. 303-320. Dunne, W.M., 1996, The role of macroscale thrusts in the deformation of the Alleghanian roof sequence in the central Appalachians: A re-evaluation. American Journal of Science, v. 296, p. 549-575. Couzens, B.A., Dunne, W.M., Onasch, C.M., and Glass, R., 1993, Strain transition at the juncture of two diachronous thrust systems: Southern vs. central Appalachian foreland: in Hudleston, P.J., Casey, M., Dietrich, D., Ford, M., and Watkinson, A.J., (eds. ), The Geometry of Naturally Deformed Rocks, Journal of Structural Geology v. 15, 451-463. Evans, M.A., and Dunne, W.M., 1991, Strain factorization and partitioning in the North Mountain thrust sheet, central Appalachians, U.S.A.: Journal of Structural Geology, v. 13, 21-35. Dunne, W.M., and North, C.P., 1990, Orthogonal fracture systems at the limits of thrusting: An example from southwestern Wales: Journal of Structural Geology, v. 12, p. 207-215.